Citi, the global financial services company opens its Arup Associates designed New Data Centre in Frankfurt. The new building sets new standards in sustainable design, set to bring about dramatic changes in the way that energy-hungry data centres are designed and built in the future. The Information and Communication Technology industry produces 2% of global CO2 emissions, a figure equivalent to emissions from the aviation industry. In addition energy usage in data centre continues to grow as a result of developments in new, more powerful technology solutions. Therefore efficient data centre design plays an important role in our drive to cut carbon emissions. This exemplary building has the potential to change the way that data centres approach energy efficient and sustainable design, and this is perhaps the most important aspect of the building’s realisation. The Frankfurt Data Centre is a landmark green building. The environmentally-conscious building, designed by British architectural practice Arup Associates for Citi, has already been honoured for its ground breaking eco-friendly design. Even before its completion, the project was awarded the Data Centre Excellence Green Energy Efficiency Award 2007 and the title of Overall Winner at the Financial Services Technology (FST) Magazine Awards 2008. Built at Am Martinszehnten, some 10 km from Frankfurt city centre in the northern district of Kalbach, Germany, the 100,000 sqft nett European Data Centre is the first building in Germany that will achieve LEED accreditation, attaining Gold standard and possible Platinum status, pending USGBC final evaluation in October. It includes office space totaling some 16,000 sqft and separate storage facilities. The building incorporates a raft of environmental measures that achieve maximum sustainability with no compromise to operation or reliability. From an aesthetic perspective, the design of the complex is a combination of intelligently designed inhabited spaces and extensive green planes, the latter facilitating in the reduction of rainwater run off via harvesting ponds. Landscaping includes generous green spaces throughout the site, the built mass being set back from the site boundaries buffered to all elevations with ‘garden zones’. The physical enclosures are all treated to affect future screening from surrounding buildings utilizing new indigenous deciduous trees, hedges, greened walls or greened wire mesh fences. However, the most radical green innovations, and those that have the most impact on the data centre’s environmental performance, are mostly hidden. The facility is designed to operate continuously delivering critical services 24 hours a day, 7 days a week and 52 weeks a year. This is achieved by using a combination of redundant or standby energy systems or ‘live’ duplicate provisions of service. However, the buildings’ energy use is greatly reduced in relation to similar centres of the same type. 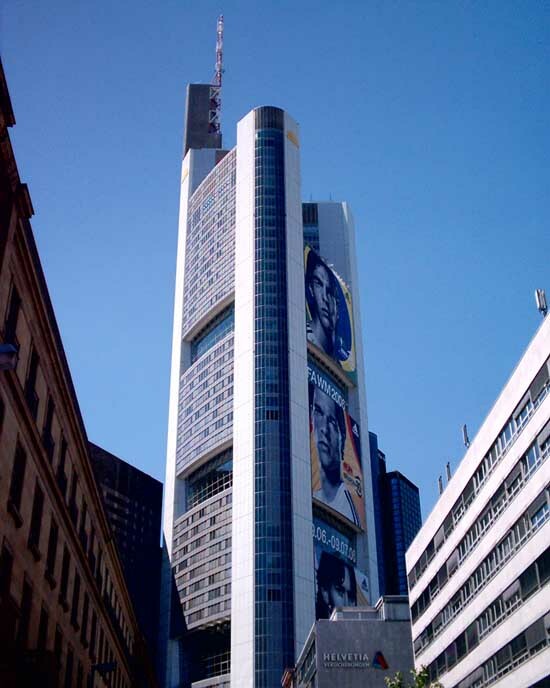 The Frankfurt Centre will use only 30% of the power required for services that a conventional data centre would utilize and only 40% of the heating energy. This results in an overall annual CO2 emission reduction of 11,750 t/a . Cooling water consumption is also a major factor in this type of building, and, through the use of innovative reverse osmosis water treatment in the cooling plant, Arup Associates’ design saves 35,950,000 litres per annum. Construction techniques have also been refined to reduce waste and save time/costs.